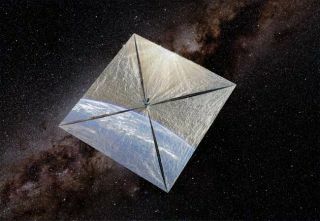 An artist's concept of the LightSail-1 spacecraft, which scientists hope will prove that sunlight can power a ship through space. The quest to fly the first solar sail spacecraft is back on,with scientists once again hoping they can harness the energy of light to powera ship through space despite earlier failures. The Planetary Society recently announced plans to build a solarsail craft by the end of 2010, thanks to a $1 million anonymous donationmade to the Pasadena, Calif.-based organization to reignite the project. "This was an enabling donation, there's no doubt,"said Bruce Betts, Planetary Society director of projects. "We've beencontinuing to think and do studies, but we didn?t have the funding in place toembark on this project. Now we do." The Planetary Society aims to launch a spacecraft called LightSail-1to an orbit of about 500 miles (800 km) above Earth to demonstrate that energyfrom sunlight alone canpropel a ship through space. The push of photons against the spacecraft'smirror-bright sails should provide enough energy to keep the craft's orbit fromdecaying, scientists think. The recent donation reinvigorates the Society's solar sailhopes, which weredashed in 2005 when the Russian Volna rocket carrying its first solar sailprototype, Cosmos 1, failed to reach orbit. Betts said the donation provided about half the necessaryfunds to build LightSail-1, but the project would take about $2 million total. ThePlanetary Society is soliciting contributions from other supporters to make upthe difference. The 2010 goal does not leave much time to achieve a launch,but the Society says it's already made some progress toward designing andbuilding the new craft. It plans to capitalize on knowledge gained during theCosmos 1 project to accelerate plans. "It is a very short turnaround with a tightschedule," Betts conceded. "We definitely have a head start becausewe've been thinking about this for a very long time." Even so, the design of LightSail-1 is significantlydifferent from the previous attempt, and is intended to be much smaller andeasier to launch. Engineers plan to use Cubesattechnology, which helps miniaturize satellite components to save launchweight and volume. One Cubesat is a box about the size of a 1-liter container and10 centimeters on a side. LightSail-1 will use one Cubesat box for its centralelectronics and control module, and two additional ones to house the solarsail, which will be made from 344 square feet (32 square meters) of mylarfabric. LightSail-1 is intended to be followed in a few years by twosister craft on missions that will travel farther out in the solar system. The solar sailing concept was proposed in the 1920s, but noone has yet succeeded in demonstrating that it works for a controlled flight inspace. In addition to the Cosmos 1 disappointment, NASA's NanoSail-D attempt waslost in the thirdfailed flight of SpaceX's Falcon 1 rocket in 2008. Many are hoping this new vehicle will work, including AnnDruyan, artist and widow of famed astronomer Carl Sagan, a Planetary Societyco-founder. Druyan is serving as Chief Advisor to the current project. "Carl and I once wrote, 'We have lingered too long onthe shores of the cosmic ocean. It?s time to set sail for the stars,'" shesaid. "We are celebrating his birthday by announcing the maiden voyages ofa fleet of ships conceived to fulfill that mythic imperative. I think I knowwhat this would have meant to him."